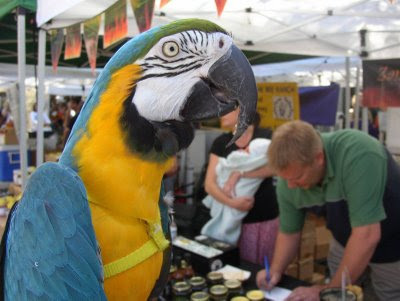 Aboo is a DNA-sexed male blue and gold macaw (Ara ararauna), hatched in October, 1999. Aboo was named for Aladdin's sidekick, the monkey, and does the name ever fit! Aboo never had a cage he could call his own home until he came to us in 2004. He lived the first three years of his life on a T-stand. Aboo arguing over the Sunday paper with Princess Tara and Kid Kadra. Aboo was severely mistreated before he came to us. By the time we rescued him, he was considered unmanagable and unhandleable. He would sit in his new cage and constantly repeat, in a very stern voice: Stop! Enough! I Mean It! Aboo! Now! What Did I Say! He would repeat these phrases over and over again. 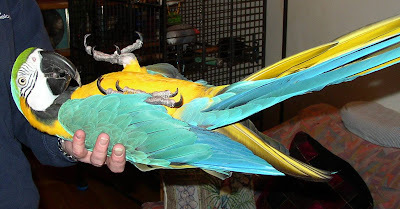 After each phrase he would grab his leg with his beak. Aboo at the Ballard Farmers Market with a halter. Aboo remains very skittish, and we need to put a halter on him when we take him out. We've already had to call the Ballard Tree Service twice to fish him out of the neighborhood trees! Aboo took to wearing his halter right away. He so wants to please, that he just sits on my knee, and let's me or my partner put the halter over his head. This shows you how unmanageable and unhandleable Aboo is now! 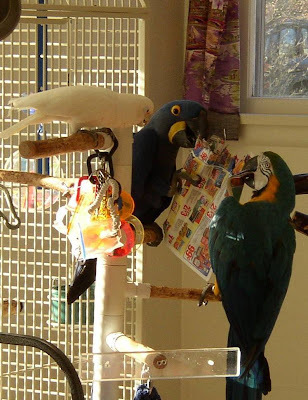 Two of the best things to happen to Aboo were getting a cage that he could consider his own space, and meeting our first blue and gold macaw, Miss Bubba Boy. So far (fortunately) the two have shown no interest in mating, but Aboo clearly recognizes Bubba as the alpha bird in the house, and wants to cozy up to her. He's happiest sitting next to Bubba on Bubba's T-stand. But he frequently asks to be carried to his room and to his own house, where he loves to sit on his hanging rope ring and play with his toys. Because he's so skittish, he can't live next to a window, so his house is in one of the basement rooms. We call him our guard dog, because no one can walk past the house on the sidewalk without him raising an alert.